It’s been a great growing week over the last five days or so. I always worry about those things which are planted, but just need some more heat and light to ripen and get ready for the box. Although a lot of those melons are still not ripe, at least the late corn seems to be coming along and you’ll see some this week. Also there are those “fall crops” which we plant in July or so which I’m always worried about…fall lettuce, spinach, carrots, turnips, broccoli, and cabbage. I get worried because the fall can be so fickle; it can be so cold and wet that a lot of those crops just don’t finish in time and that just drives me crazy! We did all the work to bring the crop along, but mother nature just didn’t get the memo about our plan. This weather sure helps, so I expect some of those greens to make it next week, namely salad mix and arugula. 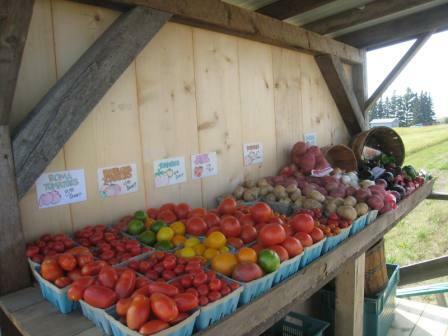 The other news I’m really excited about is the completion of the farm stand. It turned into one of those summer projects which had so many details that I just couldn’t bring myself to finish it off. Kind of like an afghan or something you started…”boy, this is going to be nice, but I know I’m going to have to put in another 40 hours to finish it.” Kind of kills your motivation, especially if a bunch of other things are consuming your time. Still, it was a bunch of work. My father-in-law and I had it all framed in late July, but I still had to level out a place to sit it on as well as put on the tin roof and back wall. You see, since we have one of those raised driveways, I had to dig in a retaining wall and fill in an area to make it somewhat level…otherwise the stand would have sat at a 45% angle—not good. Mar and I spend a couple nights this week collecting big rocks from our pasture and our neighbor’s land. Along the way we even had a medical emergency since Will got carried away with throwing rocks out of the wagon and beaned his sister with a rock the size of my fist…not cool! Anyway, at the end of the rock-hauling project, it was just me, a diesel tractor, a 700-pound farm stand on skids, and a few chains. When I get into these “farm engineering” projects, I just can’t help dreaming up scenarios where the farm stand is completely destroyed, the tractor starts on fire, or I’m fatally wounded. I had similar visions when we were moving the walk in cooler in the machine shed. Luckily, I dodged another bullet to tell you all about it. 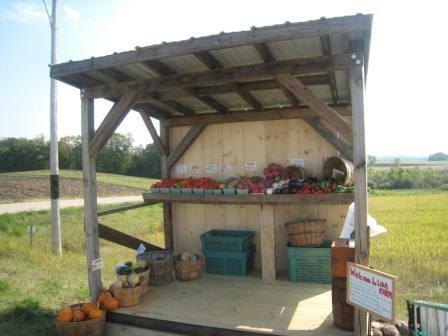 Now that the stand is at the end of our driveway, we just need to put on some finishing touches like a sign and a lock box as well as get the word out (which may not be too hard since we had our first customer come by looking for produce 90 minutes after pulling it in place). But this is the easy and fun part and we’re sure to have things up and running by Sunday. Our plan is to have the stand open Friday-Sunday for sure.